What a week. I just finished up another overnight at the hospital with Miss Beazy. (Actually, I was there all day yesterday but Jordan took the night shift – good man). It all started last week when Bea’s intake started slipping. She went from about 30oz/day to about 20oz/day (and that still counts us getting up and feeding her every 3 hours). 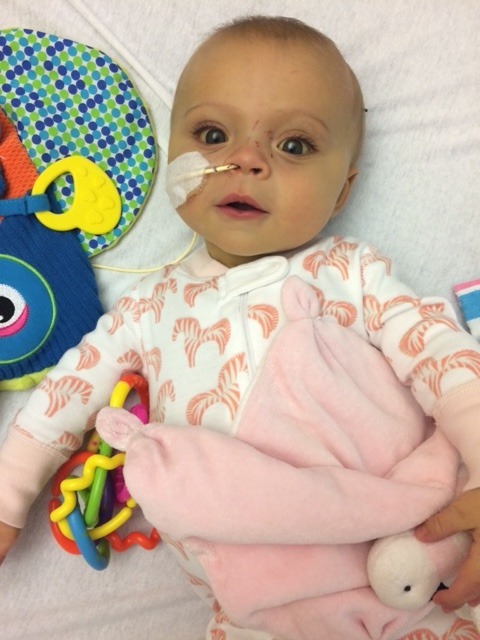 She just wasn’t taking as much which was to be expected since her liver is getting so big and pushing on her stomach; thus, making her feel fuller faster. That opened things up for discussion and we decided that it was best for Bea to get on a feeding tube and get her nutrition to it’s peak before the surgery. 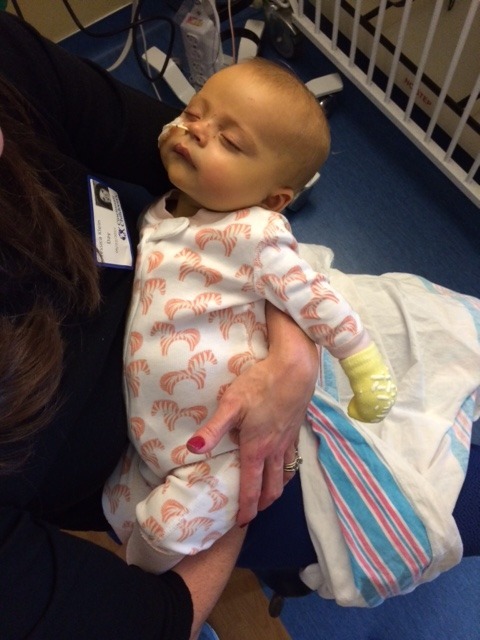 SO – we went to the hospital Monday at 9am and had one of the worst days of the last 3 months. Putting the feeding tube in was the hardest thing I’ve had to watch. Her screaming, crying, frantically pulling away while she was bleeding out of her nose while they were putting the tube in is a memory I hope goes away. I tell my family that I have a lot of good days and few bad days. This was a bad one. After it was in and she was settled with the feeling, she tolerated it pretty well and we began some serious training on how to operate the damn thing. 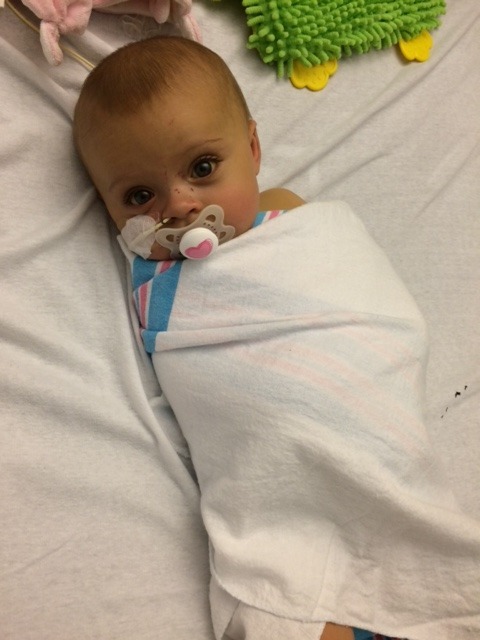 Positives – we can now give her 10+ medications through the feeding tube (with the exception of 1 that still needs to be taken orally). Second positive – We only have 2 weeks left. Negatives – she now officially looks sick. It was a big realization for me because all of this time – Bea from the outside didn’t look sick. I do have to say that she rocks the feeding tube SO well and looks so beautiful. Second negative – it is all very complicated. How to works, how to hook it up, how to get it back in if she rips it out with her curious 6 month old hands, etc. There was so much to learn and it was a little overwhelming. SOOOOO – I hate to be a downer but this was a DOWNER. Being a mom and worrying about your little baby is hard enough but what she’s gone through over the last 3 months just doesn’t seem fair sometimes. The only thing that is getting me through ALL of this is looking at someone like Jessica Klein. 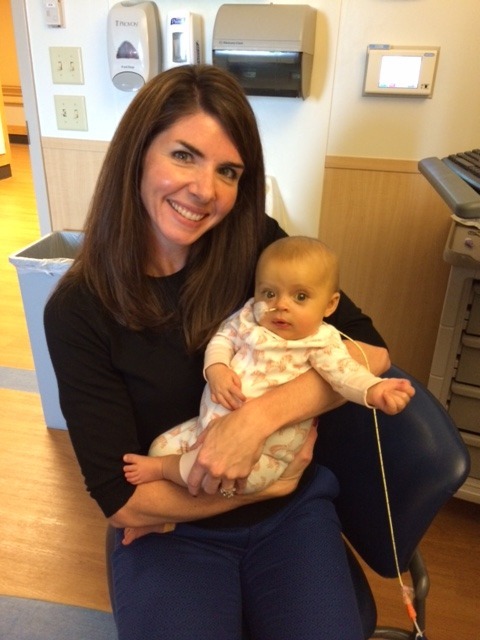 Jessica Klein is a woman our doctor introduced me to that was a living donor for her daughter with biliary atresia. Jessica and her family live in Louisville and she was in my EXACT same spot just 3 years ago. A couple of months ago we connected for a drink downtown and chatted all things BA and transplant. She was just in town for work and came to the hospital to meet Bea yesterday. After my horrible morning it was such a relief to sit down and talk with her again. Her daughter just turned 4 and is so happy and beautiful. It literally brings tears to my eyes as I type this. I will be Jessica Klein in 3 years. Bea will be Katherine Klein in 3 years. And I, Hillary Weidner, am not afraid of the feeding tube.